Bushnell 731303 Trophy 1x25 TRS-25 3 MOA Red Dot Riflescope 731303 FREE SHIPPING! 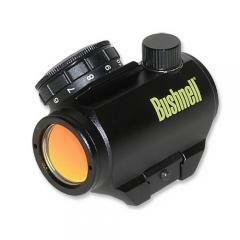 The Bushnell Trophy 1x25 TRS-25 is a high-performance red dot sight designed for use with rifles and shotguns. Its parallax-free viewing and unlimited eye relief allow you to use the sight from almost any firing position so you can engage your target more rapidly. The multi-coated optics maximize light transmission to provide a bright image even in low-light conditions, and the Amber-Bright coating enhances contrast, making it easier to pick out the target from a similarly-colored background. The compact, shockproof design withstands recoil impacts easily, and features a nitrogen fill for total water and fogproofing. I installed this, my first red dot sight, on an AK47 variant. I sighted in to be on at 25 yards, knowing that it would be a few inches high at 100 yards and on again at about 200. It was easy to sight in, I made only seven test groups of 3 shots each, then took it to the one hundred yard range where, as expected, is was a few inches high. So it's easy to sight in and effect in getting on target I hit better with this at 100 yards than I do with iron sights. If I could improve anything it would first be the covers they're not quick enough to remove, like flip up covers would be. (But this is an inexpensive red dot.) Next, though I sighted it in in cold weather which may have something to do with it, the dot brightness control was a little stiff to turn. Truly though, for the price, I think it's a great value. I'll likely be buying a second one for a shotgun. I would recommend this sight. ©2002-2019 CopsPlus.com: Bushnell 731303 Trophy 1x25 TRS-25 3 MOA Red Dot Riflescope 731303 FREE SHIPPING!